Malperfusion syndrome is a lethal medical condition, which affects 25–40% of patients with acute aortic dissection. 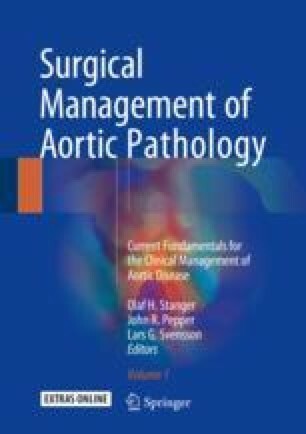 Obstruction of aortic branch vessels caused by the dissection can endanger one or more vital organs, and timely and adequate management is crucial to restore flow. In type A dissection with malperfusion, treatment consists of primary ascending aortic graft replacement and is associated with high rates of mortality. An alternative strategy is to perform endovascular fenestration and stenting first, to resolve malperfusion, and delay open repair. In type B dissections, TEVAR is the first choice of treatment. In selected patients, endovascular fenestration can also offer favorable outcomes. In type B dissection, open surgical techniques are actually limited to patients in whom endovascular repair is contraindicated or has previously failed. In this setting, surgical fenestration can be effective at reversing ischemia, whereas open graft replacement can be adopted when the aorta is enlarged. Extra-anatomical bypass grafting is useful in high-risk patients with only lower limb ischemia.